MSD Timing Light UNIVERSAL - Pann Auto Performance - San Diego largest aftermarket automotive performance parts - What do you drive? Timing Light – Part# 8990 – The MSD Timing Light is built using solid state circuitry and uses a unique SCR (silicon controlled rectifier) that provides accurate and stable timing signals from 0 to 8000 rpm. The MSD Timing Light is equipped with a high output Linear Xenon flash tube and a focused fresnel lens to produce a light that is bright enough for use on the sunniest of days. A shock absorbing rubber nose cone is also added to protect the lens.This rugged timing light is built to last in rough environments. A six foot lead with a heavy duty inductive metal pickup which can be attached to the spark plug wire in any direction is supplied with the timing light for easy hookup. The MSD Timing Light can be used on all engines with standard or capacitive discharge ignition systems. Self-Powered Timing Light – Part# 8991 – An accurate timing light is extremely important to the performance of your engine. MSD’s new Self-Powered Timing Light is a tool every performance tuner should have. 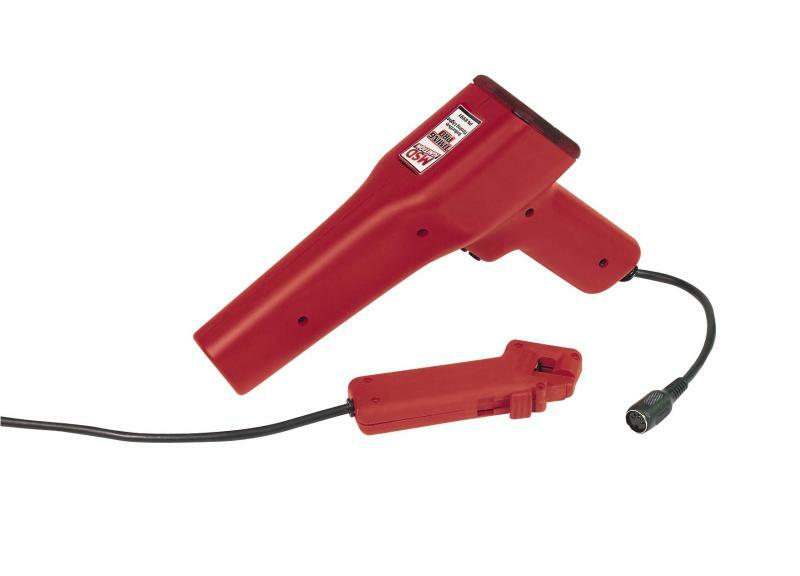 A great feature of the Self-Powered Timing Light is that it does not require 12 volts. This means less wires are hanging over the engine compartment and makes for quick, easy checks. For power, the Light uses six AAA batteries. The lightweight assembly is injection molded for great durability and produces an intense strobe that is easy to view through 5,000 rpm. The inductive pickup is detachable for easy storage.